It's hard to say exactly why Amazon doesn't have any right now. It could be the company depleted its stock packing the item onto the shelves of Whole Foods stores everywhere, or the recent $99 sale might have burned through inventory faster than the company expected. In fact, you can still pick it up for that price at other retailers like Best Buy, B&H, Target, and Bed Bath and Beyond. It's unlikely, but there is another possibility. 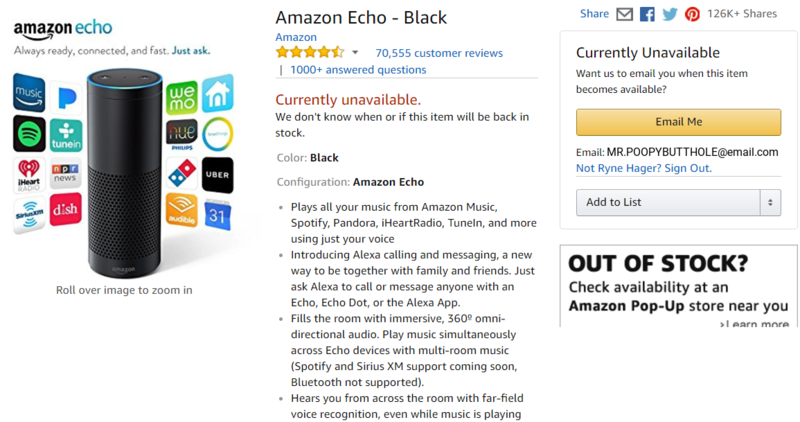 It might be that the recent pricing was meant to clear out stock intentionally, and there could be a new version or successor to the Echo on the horizon. The Echo still seems fresh in our minds, but it has been out for over two years now. Who knows? The cause could be anything from insane popularity to logistical limitations. But either way, if you planned on picking one of these up via Amazon.com anytime soon, you're out of luck.